Morning Routine: The doors open at 8.45am. The gate will close at 8.55am. If you arrive after this time, please report to the office. PE: PE is on Friday mornings. We recommend PE Kit stays in school all term and is taken home for a wash during the holidays. Clothing: Please ensure your child comes to school with a coat everyday. The children have been allocated a pair of school wellies to wear when it is wet and muddy outside. Please name all clothing so that lost items can find their way back to their rightful owners. Bookbags: Please bring you bookbag, reading diary and class library book to school everyday. Library: Class Library books will be changed on a Thursday. Please leave Library books in Bookbags and we will change them. Cooking: The Robins will get an opportunity to cook each term. Please inform us of any allergies so we can plan accordingly. 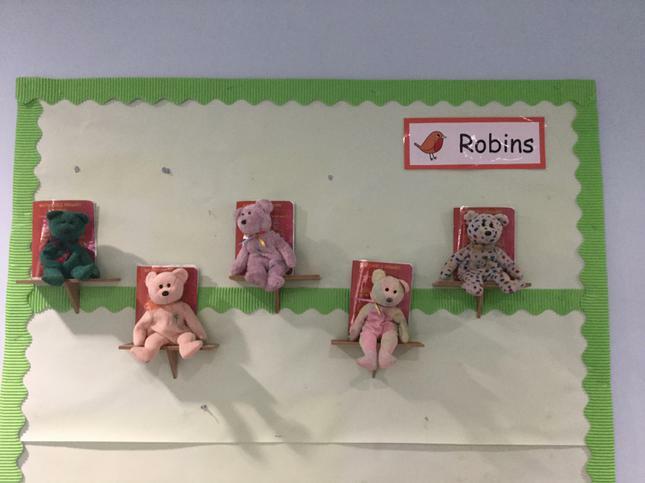 Travelling bears: We have 5 intrepid travelling bears who love to go on weekends away or holidays with the Robins. They have their own passports, so are free to roam! If you are planning a trip, you can borrow a bear to accompany you. You can add photos, drawings to the passport and then share your adventures with the class on your return. Popcorn sheets: The children will occasionally come home with 'WOW' popcorn sheets in their bookbags. These are for you to record any wonderful things your child does at home. It could be riding a bike for the first time, moving up a swimming level, helping to wash the car, being really kind and helpful etc. Anything that makes you feel proud would be perfect! Completed sheets need to be sent into school to be displayed on our 'popcorn' wall. This will enable us to get a fuller picture of your child's skills and strengths. Once every Robin has completed a popcorn sheet we will celebrate with a popcorn party.